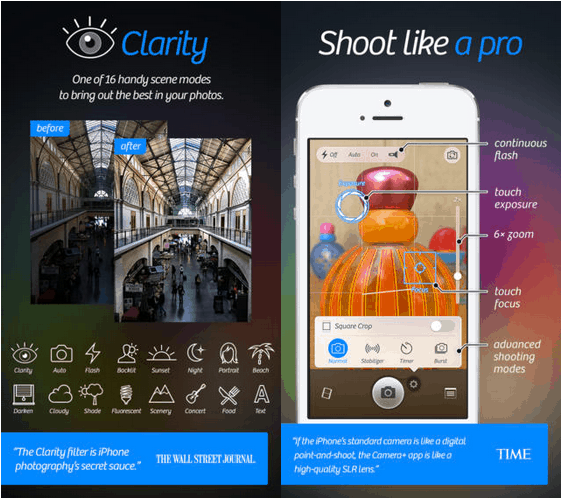 There is no shortage of photography applications for iPhone users. There are thousands of different applications available in the App Store to make thing crispy for everyone. However, if you are following any iPhone Photography application series around the web then you must be aware of the editor’s choice Camera+ for iOS. The Camera+ 5.0 for iOS now released in the App Store with all new interface, and flattened icon for iPhone users. The latest application update has several major features, and overhaul. As you can see the difference in the application icon, the Camera+ 5.0 totally becomes iOS 7 optimized application with extra new filters to sharp your images. In the application, you can apply 1-tap filters for quick editing and for advanced editing the application still has long range of tools on iPhone. Here’s everything that’s new in Camera+ 5. Dozens of icons in the app have been redone and have the perfect look to go with iOS 7. This new version of Camera+ for the iPhone and iPod touch is free for those who’ve previously purchased it. Camera+ costs $1.99 in the App Store.